An ancient sea monster hunted to extinction has been discovered on a remote Russian island. 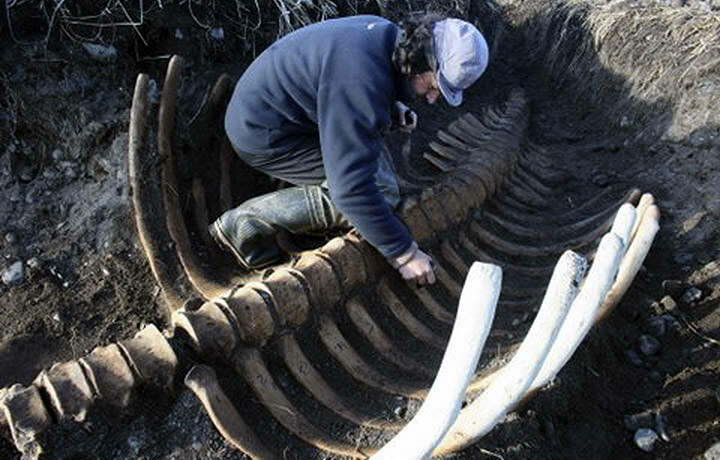 The headless remains of the beast at first appeared like a ‘fence’ but local officials on a nature reserve survey soon realised they had made a remarkable find – the ribs of this ancient creature. Digging down 70 centimetres below the surface uncovered the headless skeleton of the Steller’s sea cow, a mammal endemic to this region which became extinct in the 18th century. As the pictures show, they found 45 vertebrae, 27 ribs, a left scapula and other bones. Sightings of the sea cows were recorded by Arctic explorers before it died out. The species is named after German explorer Georg Steller who first documented its existence during voyage in 1741. The animals were easy prey for hunters using harpoons, with no fear of humans. The first sighting of the new discovery was by Commander Islands nature reserve inspector Maria Shitova. After she spotted the protruding ribs, an eight hour dig was organised to retrieve the remains. The islands lie in the Bering Sea between Russia and Alaska.